Robert A.M. Stern’s position to not “take new land…[but] to reclaim wasted abandonded land” advocates a new idea of revitalizing old land and buildings, giving them a second life. Furthermore, he states that abandoned land is a “result of changing patters of industry and settlement.” Since the urbanization of China, cities like Beijing and Shanghai has seen its agricultural land turn into massive scale developments to accommodate the large influx of people moving into the city needing housing. This rapid transformation has led to both the destruction and preservation of different historic reminders like old industrial factories and traditional housing structures. In the previous blog post, I referenced the Tianzifang’s revitalization into a tourist shopping and sightseeing destination. 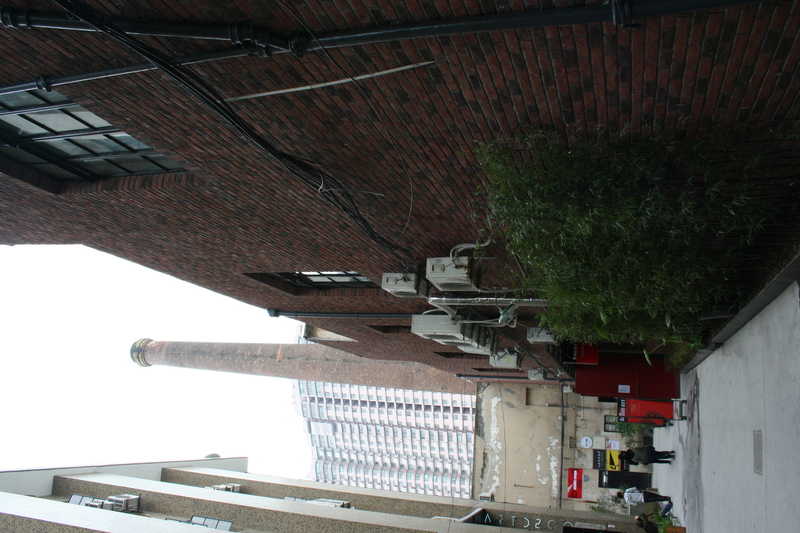 China also had industrial areas that were vacated and intended to become another housing development. However, instead of clean slating the land, artists and artisans have found a second use for these factories and thus creating China’s creative industries. After visiting Shanghai’s M50 [Moganshan 50] and Beijing’s 798, both serve as an alternative tourist destination that does not give visitors the instant gratification which typically comes with visiting other frequented destinations like the Bund or Forbidden city. The content of both creative industries is paced differently so that the visitors that visit are interested in looking through the art and leave with their own interpretation of the art. 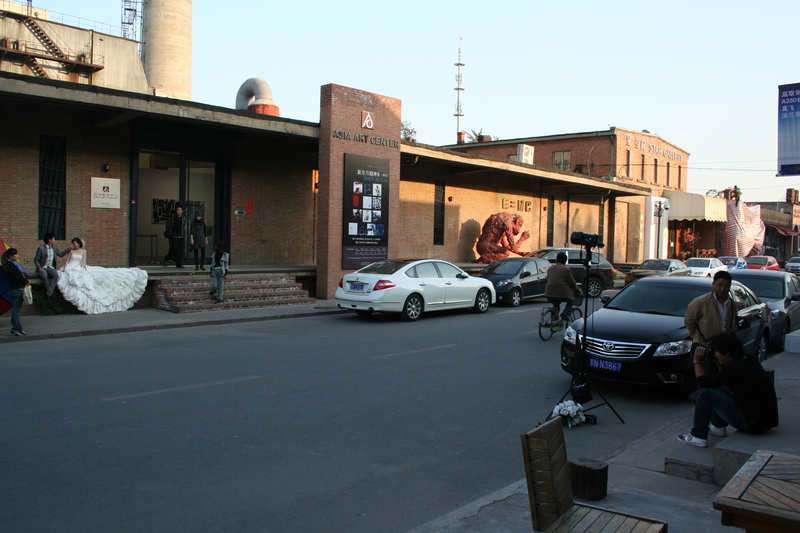 Beijing 798 and M50 serve as prime exhibition spaces for both the famous and the up and coming artists and have the inherent concept of reusing abandoned spaces. However, they greatly differ in their intentions of displaying the art. Urbanistically, 798 has main streets with smaller offshoots that lead to the galleries, boutiques, cafes, and studios. I was unable to fully explore 798 in 3 hours because each path led to various clusters of these programs that I wanted to uncover. The scale of 798 is larger than that of M50, and its expansiveness offets the megablock housing developments and fabric surrounding it. On the other hand, M50 utilizes the factories by subdividing them into many smaller spaces that houses similar programs that are accessible from the ground level or a centralized circulation space. M50 only occupies a small area along the Suzhou Creek and has expensive riverfront residences neighboring it. The site is pinned against a park and walkway along water edge for the public to enjoy. Across the river, more walls of housing towers rise and overlook M50 factories. It’s location along the creek suggests the residents who live around there have a bit of wealth to purchase some of the art pieces. The most significant difference is how the artwork displayed in the M50 and 708 galleries. The factory spaces at 798 exhibited each piece of work similar to that of a museum. However, the factories at M50 were divided into smaller spaces only allowing less space in between each artwork or sculpture, similar to products being sold at a store. Some galleries even had VIP seating areas for the patrons of the artists or galleries. M50’s attitude of selling art rather than exhibiting it for the public became apparent when I attempted to photograph the pieces I wanted to remember. I was frequently yelled at for violating the no photography rule, while at 798, I was encouraged to take my time examining the artwork and document the pieces that interested me. I could walk around without supervision while at M50, the hostess supervised me like was going to do something with the painting by looking at it for so long. At 798, the workers were interested in talking about the art and conversing with me, asking for my opinions while the ones at M50 were busy doing paperwork to kill time until a wealthy patron came to buy an art piece. Commercially driven M50 suffers from the lack of visitation because it expects art to be bought, rather than enjoyed by the public. After going to both creative industries on a weekday, M50 is a ghost town compared to 798. 798’s generous display of art stirred interest and sparked more unexpected activities to occur like the tattoo convention and wedding shoots. Regardless, both creative industries remind visitors buildings’ pasts and their new second life. It is necessary to compare the success of 798 and M50 as precedents for further creative industries to follow with similar intent– to exhibit innovative art and to preserve an area’s history for generations to come.